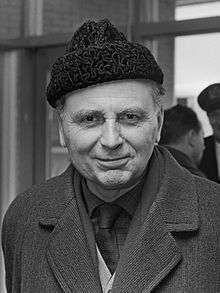 Elmar Klos (26 January 1910 – 31 July 1993) was a Czechoslovak film director of Czech origin who collaborated for 17 years with his Slovak colleague Ján Kadár and with him won the 1965 Oscar for Best Foreign Language Film with the film The Shop on Main Street. Both of them co-directed the 1963 film Death is Called Engelchen which was entered into the 3rd Moscow International Film Festival where it won a Golden Prize. ↑ "3rd Moscow International Film Festival (1963)". MIFF. Archived from the original on 16 January 2013. Retrieved 2012-12-01.